Embark on your European river cruise in Nuremberg for a grand adventure in spectacular views, German vineyards and brews. Bavarian delicacies awaits you on the Main and Rhine Rivers. 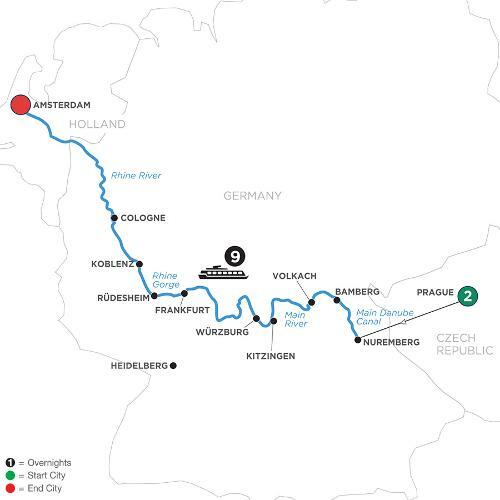 Cruise through Germany from Nuremberg on the Main River cruise portion to beautiful Bamberg. Enter a world where imperial dynasties lived with a guided tour of its Romanesque cathedral amid the seven hills crowned with churches. Tour the quaint town of Volkach and its half-timbered houses and cobblestone streets, then visit Bavaria’s largest wine-producing region with a visit to Kitzingen. Hear legends of folklore from your Local Guide, before cruising to wonderful Würzburg. See its Old Main Bridge, fortress, and frescoed ceiling of its baroque Bishop’s Residenz. Visit a Main River Village for a picturesque day in Bavaria, and continue to Mainz for a guided excursion to magnificent Heidelberg Castle. Soak in the classic Rhine Valley wine-country town of Rüdesheim—flanked by hillside vineyards. Pass through the stunning Rhine Gorge on your way to Koblenz for a guided tour of the ancient squares, , then continue to the dynamic city of Cologne—with its gothic cathedral and soaring twin steeples. Take a guided tour of the city or a walking tour of Cologne’s historical Jewish sites.